Nessa had been a gentle woman in her youth, but when raiders attacked her home and killed her family, she became a vengeful warrior, and set out on a quest for revenge against them. In time, she came to the court of Ulster, where Fergus Mac Roich met her, and fell in love with her. He courted Nessa, and asked her to marry him, but Nessa named a great and unusual bride price: that she allow her son Connor, who was only a youth, to be King of Ulster for a year. Fergus asked his people about this, and they told him it would be fine: they would all know that Connor wasn’t really their king, and he would step aside at the end of the year. For the whole year, Nessa advised Connor on what judgments to make, and at the end of the year, when Fergus came to take back his throne, the people of Ulster protested. This young man was a better king, they said. And besides, Fergus had valued the crown little to give it away to an untried youth for a year! Connor grew into a wise young man, and great king of Ulster. Nessa’s daughter, Deichtre was no less remarkable than her brother; she was courageous, skilled and daring. She drove her brother’s chariot into battle when he fought, leading the charge against the enemies of Ulster. But the sister of a king must make a good marriage, and so it was decided, with Deichtre’s agreement, that she would marry Sulatim Mac Roigh of Muirtheimhne. However, without telling anyone, Deichtre made plans to have one last great adventure before she settled down. On the morning of her wedding to Sulatim, all the warriors and noble people of Ulster were gathered in Emain Macha for the festivities. Deichtre was in her own rooms, with fifty hand-maidens primping and beautifying her in preparation for the ceremony. But when Sulatim came to fetch his bride, Deichtre and the fifty hand-maidens had disappeared without a trace! The people of Ulster searched high and low, but they could find no trace of where Deichtre had gone. She had gone to the Otherworld, to live there for a time, and had taken her hand-maidens with her for company and to tend to her needs. She explored the wonders of the Otherworld with open eyes and without fear. One day, she was sitting on the balcony of her house, and drinking a cup of wine, when a mayfly flew into the cup. She swallowed it down without noticing. Then a beautiful, shining man appeared before her. He told her his name was Lugh of the Long Arm, and that because of the fly she had swallowed, she was going to bear him a son, and he asked her if she’d like to spend the rest of her sojourn in the Otherworld with him. Fair as he was, Deichtre agreed. Back in Ulster, Connor Mac Nessa and all the warriors of the Red Branch searched for the missing women for a year, but to no avail. At the end of the year, there was another feast in Emain Macha, and a huge flock of birds descended outside, and began eating up everything, until not even a blade of grass was left. Fearing that these birds would eat up all the food in Ulster and cause a famine, King Connor and nine men of the Red Branch got into their chariots to pursue the strange birds. The birds were extremely beautiful, and flew in pairs, linked together by a silver chain. No matter how fast the men of Ulster went, the birds always stayed just ahead of them, leading them on and on all over Ireland and then into a strange country that none of them recognized. Night began to fall, and they stopped. Fergus Mac Roigh went to see if he could find a place for them to shelter for the night, and though he searched high and low, all he found was a small, mean hut. The man of the house offered to shelter Fergus and his companions, so he went back to Connor with the good news. Not all of the Ulstermen were happy with this accommodation, though. Bricriu of the Bitter Tongue immediately started to complain, saying that a hut like the one Fergus described was no fit place for a king to stay the night. Fergus, offended, told Bricriu that he was welcome to find a better place for them, if he could. So Bricriu set off through the strange country alone. High and low he searched, but he could find no house or dwelling of any kind, and at last, he gave up and went to the place that Fergus had described. There he saw, not a small mean hut, but a magnificent palace with seven pillars holding up the roof of golden thatch, and warm firelight spilling out the sides of the doorframe. The door was opened by a tall, radiantly handsome young man, and the woman beside him greeted Bricriu by name and made him welcome. He wanted to know how she knew him, and the woman of the house asked him was there anyone missing from Emain Macha. “There might be,” said Bricriu, beginning to figure out what was going on. “And would you know them if you saw them again?” the woman asked. Then Deichtre, for it was indeed she, told Bricriu her name, and sent him off with a purple cloak to bring her brother to her. Bricriu lost no time in going back to Connor and the others, and describing all the sights he had seen, but he decided it would be much more amusing not to tell Connor that his sister was found. They made their way to the house, and on the way, Fergus reminded Connor that this wasn’t his land, and that the man of the house should offer him a sign of fealty, since he was a King. Connor should ask that the woman of the house sleep with him that night, this being an old custom. Bricriu, seeing an opportunity for some mischief, said that that was an excellent idea. When they arrived at the beautiful hall, the strange man welcomed them in, but he informed Connor that his wife had been taken by the pains of childbirth, and would not be available tonight. But there were fifty handmaidens to serve the warriors of Ulster. They feasted late into the night, and each of them had the best of food and drink, and the most comfortable of beds to sleep on. But in the morning, when they woke, the great hall had vanished, and they were all sleeping on the cold hillside. There followed a great debate over who was going to have the honour of fostering and raising this child, whose father was of the Otherworld. Fergus made a case for himself; he was the former King of Ulster, he was a great warrior, he would teach the child all he knew. The steward, Sencha, argued that he should raise the child, because he was the wisest man in Ulster, first in debates, measured in his responses. He would be able to teach the boy so much. Blai the distributer, and a young warrior called Amergin also made their case for why they should be allowed to foster this remarkable child: Blai because of his great generosity, and Amergin because of his impeccable reputation. 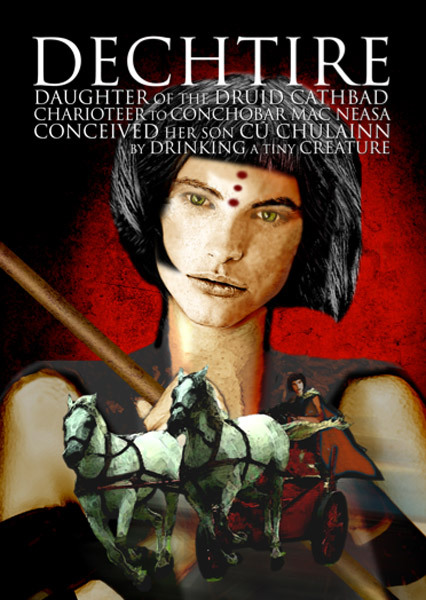 A fight threatened to break out among the great men of Ulster, and so the matter was brought before a judge named Morann, who declared that Deichtre would raise her own son in Muirtheimhne with her husband, Sulatim Mac Roigh, until he was of a sensible age. And thereafter, he would be brought to Emain Macha where all of the wisest, strongest and most generous and honourable men would have a hand in raising him.